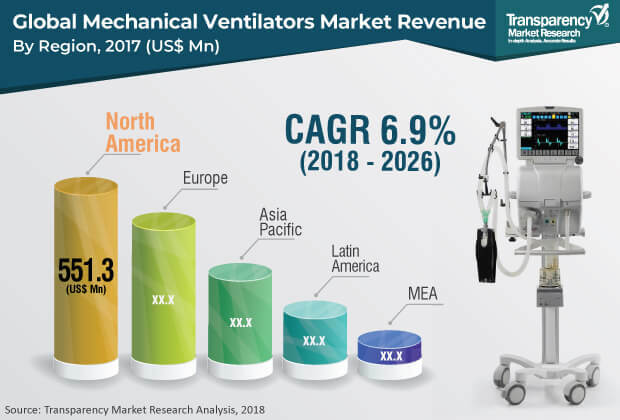 Transparency Market Research (TMR) has published a new report titled ‘Mechanical Ventilators Market - Global Industry Analysis, Size, Share, Growth, Trends, and Forecast, 2018–2026.’ According to the report, the global mechanical ventilators market was valued at US$ 1,621.5 Mn in 2017. It is projected to expand at a CAGR of 6.9% from 2018 to 2026. Aging population and longer life-expectancy, increased awareness, and acceptance of advanced devices are some factors that are likely to drive the mechanical ventilators market from 2018 to 2026. Mechanical ventilation refers to artificial breathing devices that are utilized by patients who are unable to breathe naturally due to acute medical conditions. Technological innovations in the last few decades have revolutionized the mechanical ventilators market, in terms of usage settings of these devices. Development in the technology and design of ventilators has expanded the use of mechanical ventilators not only in hospitals, but also in transport and home care settings. The report offers detailed segmentation of the global mechanical ventilators market based on product type, interface, end-user, and region. In terms of interface, the noninvasive segment accounted for a dominant share of the market in 2017. Added portability in traditional invasive ventilators has paved the way for the introduction of non-invasive mechanical ventilators, and thereby, has fuelled the market. The introduction of new portable and non-invasive ventilators has revolutionized the mechanical ventilators market. Reduction in infection risk, patient’s ability to speak and swallow, and lesser need for sedation are key factors that drive the non-invasive ventilators segment of the market. The critical care ventilators segment is expected to account for a leading share of the market by the end of 2026. Rapid rise in the geriatric population, increase in incidence of chronic obstructive pulmonary disease and other respiratory emergencies, and technological innovation in respiratory care devices are major factors that are expected to drive the segment during the forecast period. North America held a major share of the global market, in terms of revenue. It is expected to maintain its position during the forecast period. North America is home to several key market players, such as Bunnell Inc., ResMed Inc., Smiths Medical, and Medtronic plc, who have their headquarters in the U.S., where they generate significant sales. Hence, North America is a leading market for mechanical ventilators. High awareness about latest health care technologies and higher purchasing power is anticipated to boost the mechanical ventilators market in North America. The mechanical ventilators market in Asia Pacific is expected to expand at a rapid pace, primarily due to improving health care infrastructure, rising disposable income, and technological advancements in countries such as China and India. Furthermore, rise in the need for state-of-the-art ventilation equipment in emerging markets and rising incidence of premature births have boosted the demand for mechanical ventilators in Asia Pacific. The report also provides profiles of other major players operating in the global mechanical ventilators market. Other major players include Teleflex Incorporated, GE Healthcare, Medtronic plc, Koninklijke Philips N.V., Smiths Medical, Bunnell Inc., and Getinge AB. Transparency Market Research (TMR) is a market intelligence company, providing global business information reports and services. Our exclusive blend of quantitative forecasting and trends analysis provides forward-looking insight for thousands of decision makers. We have an experienced team of Analysts, Researchers, and Consultants, who use proprietary data sources and various tools and techniques to gather, and analyze information. Our business offerings represent the latest and the most reliable information indispensable for businesses to sustain a competitive edge. Each TMR Syndicated Research report covers a different sector — such as pharmaceuticals, chemical, energy, food & beverages, semiconductors, med-devices, consumer goods and technology. These reports provide in-depth analysis and deep segmentation to possible micro levels. With wider scope and stratified research methodology, our syndicated reports thrive to provide clients to serve their overall research requirement.